I believe that one of the best things to do here on this blog, is to mention those who helped Baralbait see the light. One of my major problems when I started creating Baralbait was that I wanted to have applications to be installed on GPS-enabled mobile phones in order to help people update their current Geo-Location on Baralbait. And the problem here was that it was not feasible to start writing different applications for the different mobile phones out there, especially that I have limited resources and mobile programming knowledge. Also Nokia charges developers if they want to interact with their GPS APIs, as they have to purchase special certificates and use them to sign their code. So, in brief, I've to say that if Leah's oAuth library wasn't there, no one would have been able to updated his/her location on Baralbait easily, and the service would have missed one of it's major features. And finally, big thanks to Leah and her awesome library. You create new places, and share your thoughts and past experiences in those places using Baralbait's micro-blogging feature or geo-wall. You can also rate those places, and give them one, two, three, four, or five stars. But we all know that a picture is worth a thousand worlds. And that's why we have decided to give you the ability to publish pictures taken in a certain place. 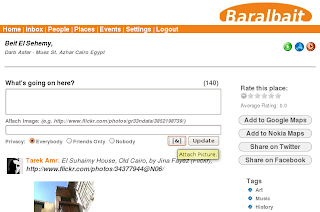 After going to a certain place's page on Baralbait, you can click on the attachment button in the geo-wall section, and then you can add your picture's URL. Have fun taking photos when you go out, and don't forget to share them with us.